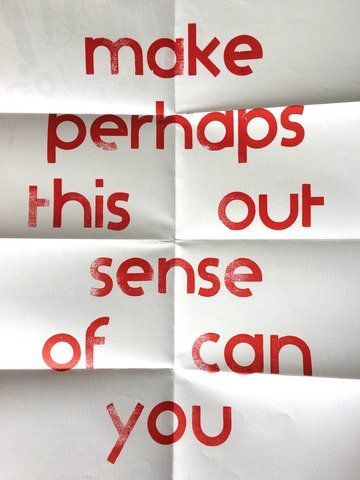 Make Perhaps This Out Sense of Can You was a symposium at Chelsea College of Arts, on 21 May 2015. It contextualised Bob Cobbing’s work as a poet as well as looking at his legacy as an organiser. The day was built around concerns that continue to be relevant today, such as the value of artist-led publishing initiatives, the productive qualities of an archive, the role of regional arts centres, and the intersections between art, literature and music. Make Perhaps This Out Sense of Can You was programmed by William Cobbing and Rosie Cooper and presented by Camberwell, Chelsea & Wimbledon (CCW) Graduate School. Bob Cobbing (1920-2002) was a sound, concrete and visual poet, best known for his performed works in which language was anarchically stretched through shouts and hisses, interspersed between more recognisable tracts of spoken word. He was also a prolific organiser and collaborator: one of the founders of the London Filmmakers Co-op in the 1960s, manager of Better Books from 1965-7, and his imprint Writers Forum was amongst the first in the UK to publish works by John Cage and Allen Ginsberg. Make Perhaps This Out Sense of Can You contextualises Cobbing’s work as a poet as well as looking at his legacy as an organiser. The day is built around concerns that continue to be relevant today, such as the value of artist-led publishing initiatives, the productive qualities of an archive, the role of regional arts centres, and the intersections between art, literature and music. 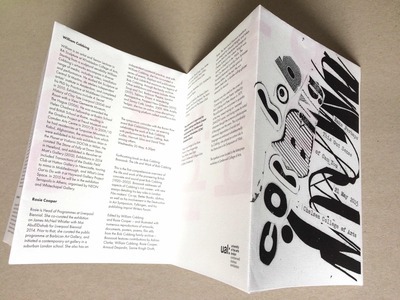 A special screen printed poster was designed for the symposium by Camberwell BA graphics students Louis Hodge and Tom Stone, utilising the Semi-bold Flaxman letterpress, located at the letterpress workshop at Camberwell College of Arts. The symposium coincided with the Raven Row event 'Bob Cobbiiiiiiiiing Live', an evening celebrating the work of Bob Cobbing, with performances by Brian Catling, Beth Collar, Hannah Silva and David Toop.